After a series of leaked images and specs, a rumor now has it the Sony Ericsson Xperia X2 will be officially announced on June 17. 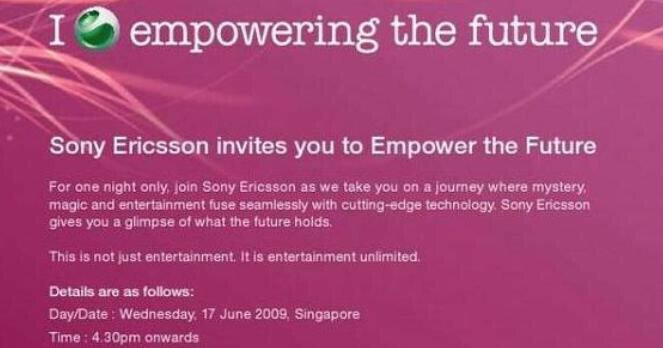 A user at the Club Sony Ericsson forum has posted an image, which is said to advertise a special event that should take place in Singapore on June 17. Users believe the whole thing might be the announcement of the Sony Ericsson Xperia X2. If that’s correct, then it seems the new Xperia actually falls into the new Entertainment Unlimited line of the manufacturer. Of course, nothing has been confirmed yet and there is a good chance Sony Ericsson may come up with another handset that has nothing to do with the X2.